Lost Worlds is a magical concoction of battles, wizardry, potions and even a love story. Join The Story Hunter on his death-defying adventure to find the lost world of Lyonesse. The journey will introduce you to the ancient heroes of Cornwall as the young Tristan earns his spurs as a knight of the round table and defeats the terrifying invaders from Ireland. The beautiful Iseult’s mother tricks him into drinking a love potion, and starting an affair that leaves Lyonesse, Cornwall and King Arthur’s England at the mercy of their foes. Can Merlin save the day? Hundreds of years later the people of Lyonesse are in danger again from the monstrous creatures that live in the deep waters around Cornwall. Step forward the handsome and enigmatic Trevelyan to strike a deal with all parties and make a decision that will forever change the shape of England. Adventure and excitement are the order of the day, as the whole family will enjoy this glorious dip into the crazy world of John Brolly. Arrive early and enjoy the fun pre-show activities including free face painting and a treasure hunt. From his latest research papers Professor Crumble tells a collection of tall and short stories about monsters and creatures both mythical and true. Local storyteller John Brolly is back with this new show for children and well behaved adults. 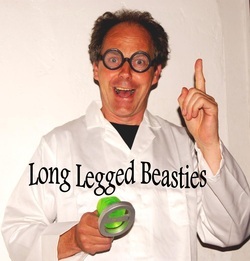 This latest venture sees him as Professor Crumble, the world’s foremost expert on all of the strangest and most monstrous creatures in existence.This is a wonderful concoction of storytelling, poetry and fun that will delight the whole family.